In the editorial of The Waxing Moon published for Samhain1970, Joe Wilson announced "The Pagan Movement in Britain and Ireland is formed". He continued "I had been thinking about the need for a pagan organisation since I arrived in this country over a year ago. Yet I didn't know if I would be able to do it, and was certain I could not start it alone. On 30th July I went to Wales to visit Tony Kelly and ... the initial steps were gradually formed." Meetings were initially held at Joe's home in Oxfordshire, but after he returned to America the focus moved to the remote valley in Wales where Tony lived in what remained of a commune called the Selene Community. The land surrounding the house became the location for the Movement's seasonal rites and the house itself the central point of communication for the Movement. 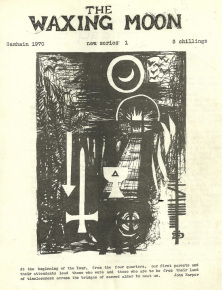 From here newsletters were hand-typed onto stencils and printed on an ink duplicator for distribution to members, as were most editions of the magazine The Waxing Moon. Tony Kelly's later reflections on why the Movement was formed are Here.